Outpost Combat 2 is a sequel of the assault/defense strategy game featuring: Now the even more fantastic detailed isometric pixel art! 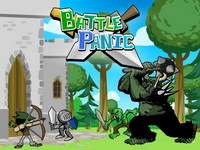 Now the game has become more challenging – fight with two enemy armies at one time! Achievements added! New special abilities, which let the player to destroy the enemies by oneself: - Kill the enemies with the sniper rifle! - Call for artillery shot to destroy large enemy gatherings! - Use building attack to clear up the enemie’s building! Another exciting game provided by the Nimble Piggy! Lead one of 3 nations in the battle for Rivadis in this real-time strategy game. Capture enemy lands and defend your own. Conquer the castles and towns of the undead! Colliding Fronts is tower defense game inspired by World War II theme. Aggressive German troops are trying to break through weak front lines. You must prepare and repel incoming forces. Defense asks some logics, so its healthy for your brains ! Main features: The game consists of 10 levels. Game difficulty increases as you progress through levels. There are 7 different bunkers, AA batteries, turrets to build based on WW2 military. Upgrading system has a very unique approach, where you spend money on upgrading tower damage, range and reload speed. To make things even more interesting there are 3 supporting buildings, which increase effectiveness of nearby towers. Enter Spellcreepers and challenge your opponents for this magical trial of strength. Unleash a powerful combination of offensive and defensive spells and triumph over your opponent. Spellcreepers tests your might in many different ways as it generates a random playfield for a every duel. When playing for the first time, Spellcreepers' winged mascot "Spike" will introduce you to the secrets of spellcasting. Wield powerful magic and become adept in overwhelming that other Spellcreeper. Warzone is a tower defense game where you must attempt to survive as long as possible by building the most efficient line of defense. Donuts! Donuts! Make a killing in the donut world! Run your donut business, upgrade you store, create tasty donuts, keep your customers happy, watch the weather and sell sell SELL! This is a very challenging game and you need to experiment a lot with it to get things right and to be a success - so don't give up!